I am perpetually looking for better lights for Grace, both inside and out. Many of them are either too bright, the wrong color light, or require too much wiring to install. I stumbled across the Mantus Snap-On Light randomly a few months ago and love the portability, easy install, and light quality that it provides. 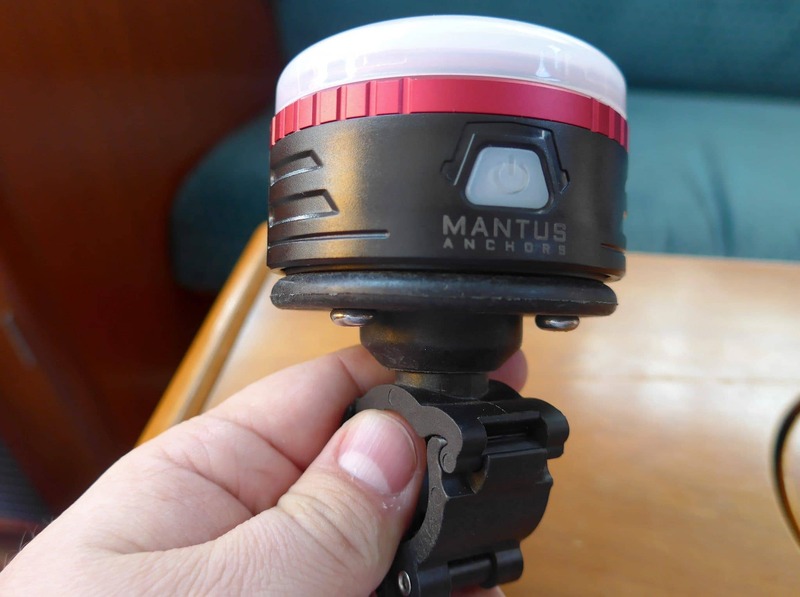 The Mantus Snap-On is a rechargeable, rail mounted device that provides multi-level white and red light. It’s solidly built, the upper part being made of aluminum and plastic, and has a glowing power button on the front depending on the light setting. 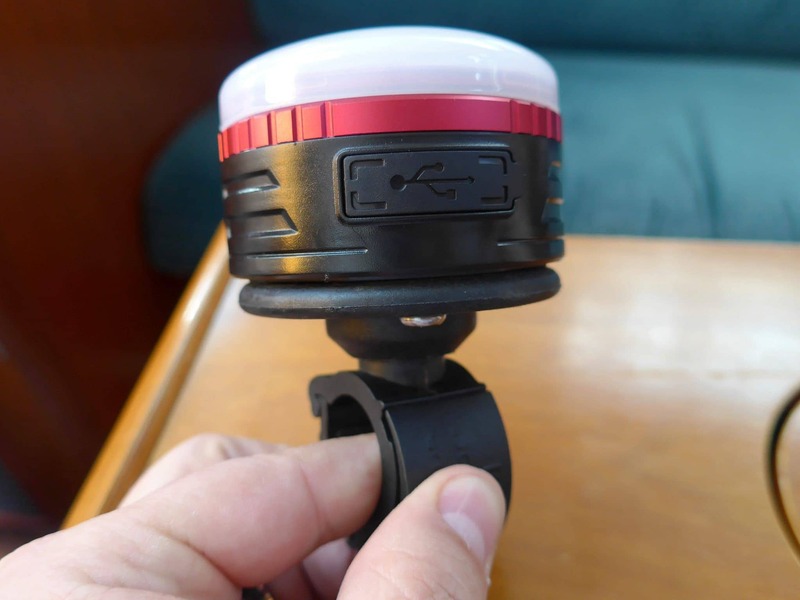 The charge port on the back is waterproof and covered with a removable plug. 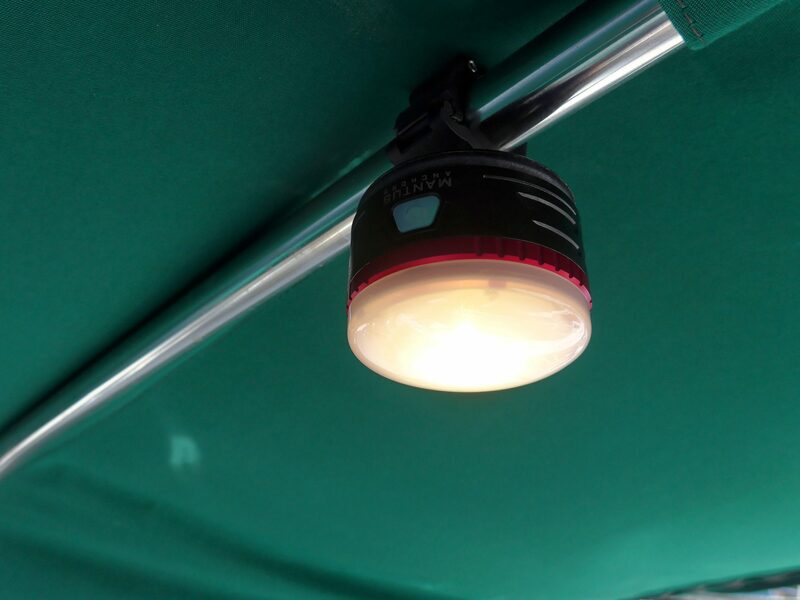 The light charges pretty quickly when completely depleted, and the power light will go from red to green to let you know it’s ready for use and fully charged. It can be charged via any standard USB charger with a micro-USB cable. That means one less proprietary charger to carry around on the boat. 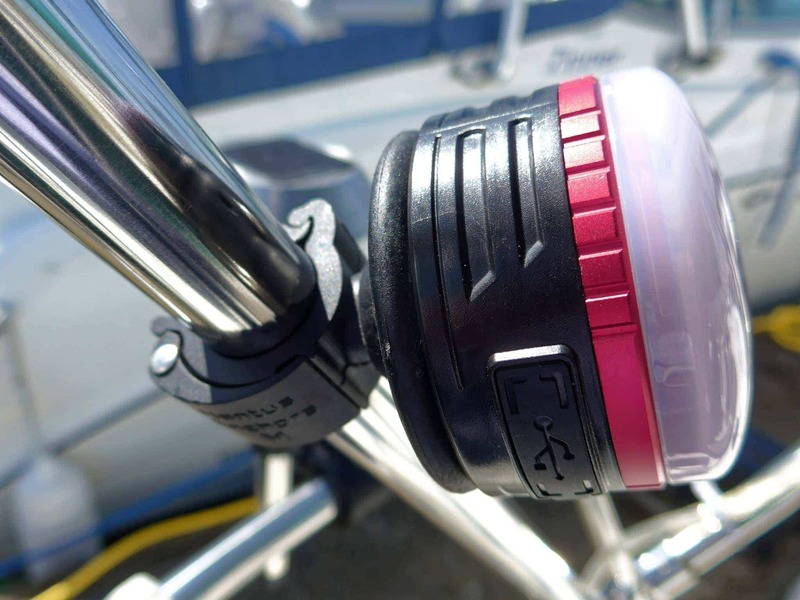 The light attaches very securely to a rail, and comes in three diameters – 7/8″, 1″, and 1 1/4″. The attachment system is a double ratchet of sorts, and is so tight that you can’t rotate the light on the rail without releasing it. The best part about the light is the quality and warmth of the light itself. It appears that Mantus is using a single LED (most likely CREE if I were to guess) and have provided a diffused lens that makes it a nice warm, non-LED glow – specs say 2700k for the color temp. Many other lights I’ve tested and used have been harsh colors, very focused beam angles, and generally functional but not comfortable. One of these in the center of Grace’s cockpit area provides great light all throughout. With two on opposite sides of the awning, I can work on projects all throughout with clear visibility. The light is powered by a 3.7V 2700mAH rechargeable lithium-polymer battery, and is designed to be IPX5-level waterproof and survive decent drops. You can charge other devices off of the big battery, although I’m not sure how useful that function is. The more useful feature is the two levels of red that you can leverage for night vision. In the last few months of use, a single charge has provided multiple overnight uses. I move them around to different areas depending on what sort of activities we’re doing, and have had comments about how nice the light is. We love playing cards and hanging out late into the nights in the cockpit, so these will get a lot of use this summer and years into the future. I liked them so much I purchased two! Evening trips around Elliott Bay are some of our favorite memories. They usually involve friends who don't normally sail, and show off the beautiful Seattle skyline along with some good food and drinks. 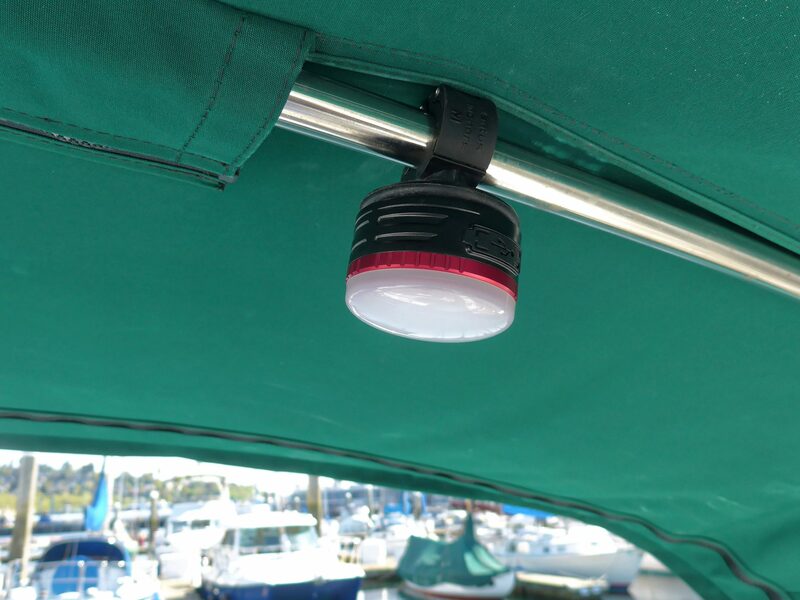 Good quality lighting is not something you have to sacrifice on a sailboat. It can also be economical now with the advent of LEDs. CREE LEDs are my favorite because of their color and quality, and I replaced almost everything on Grace with them.